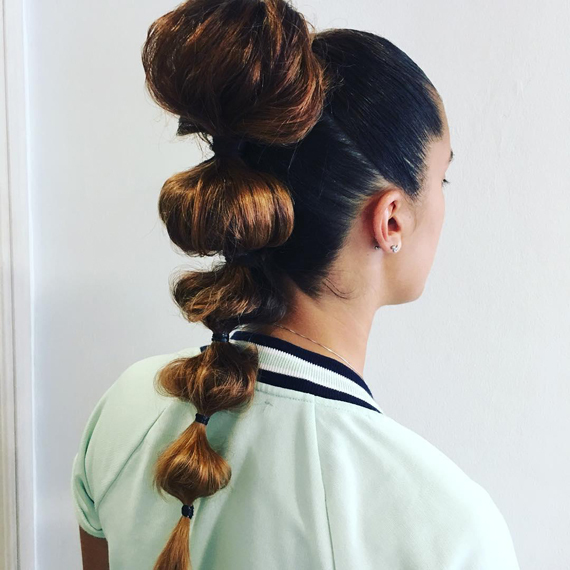 The humble ponytail has had a makeover. 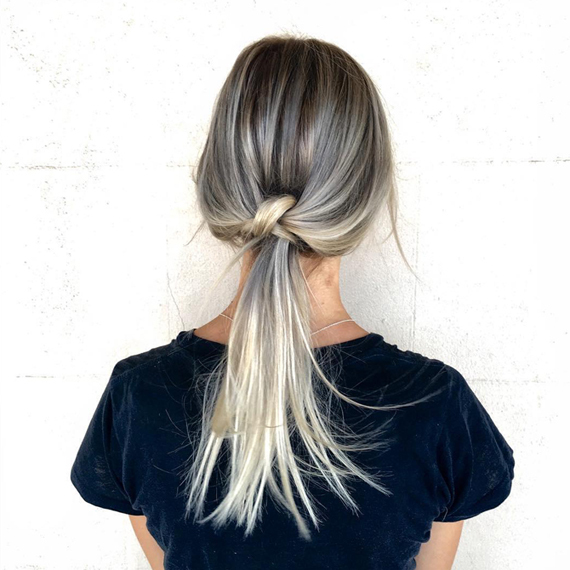 Far from everyone’s favourite go-to, off-duty style, the trend for ponytail hairstyles is growing, with new looks perfect for prom hair, festival style, wedding looks and girls’ night out glam. Forget everything that comes to mind with ponytails; haphazardly piled high, secured with an old hairband without much thought. Think super sleek and straight, a Kardashian favorite, or tousled and teased with soft waves and volume, as seen on Blake Lively. Get inspired with our round-up of the best ponytail styles for the season ahead, with a look to suit every hair type. 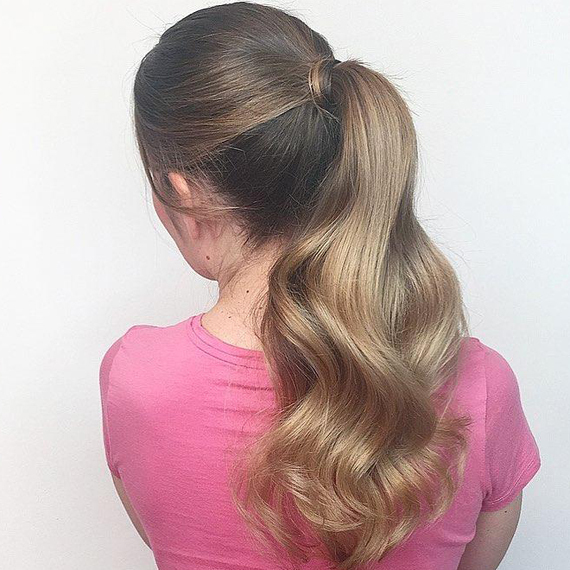 Your client’s new go-to weekend hair style: this half up ponytail oozes laid-back vibes. If the hair is freshly washed and silky, spray with EIMI Dry Me to add texture and grip, keeping this tousled look in place. Tie into a loose, low ponytail and secure, then twist the top half into a loose bun, securing around the hairband and pin into place. When ponytails go glam. This look features chic soft waves, volume and face-framing tendrils to finish; perfect for wedding and prom hair looks this summer. Start by tonging hair into loose waves using Wella Pro Curl. To achieve a sleek finish to the style, spray EIMI Mistify Me Light onto a soft bristled brush and smooth over hair before tying into a mid-height ponytail. Take a small piece of hair from the ponytail and wrap around the hairband, securing with pins to finish. Finish with EIMI Glam Mist for a lustrous finish. Let your client show off sleek, straight tresses with this simple knotted style. Start by using Wella Pro-Straight Color through the ends, then smooth EIMI Perfect Me on mid-lengths to ends for a smooth surface. Separate hair into two sections, knot together and twist low at the nape of the neck, securing into place with pins to hold. The festival-ready bobble ponytail was made for dancing by the main stage. Start by tying hair into a high ponytail. If the hair is very thick, separate into two sections and tie two ponytails – one above the other. Spread wide and fix with EIMI Flexible Finish to hold. Then, tie small bands at regular intervals down the ponytail. In between each section, tease hair to add volume and create the ‘bobbles’, spritzing again with hairspray to fix in place. 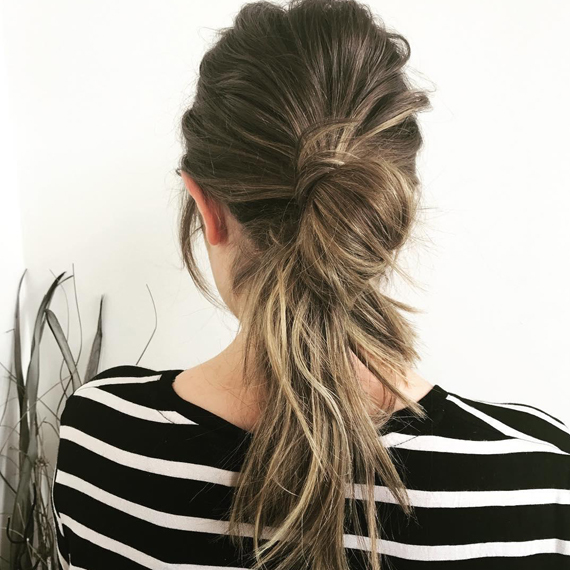 Tell your clients to forget the usual bouncy blow dry when they sit in the salon chair and opt for something a little different; this season it’s all about the power of the ponytail.